Jordens temperatur kan ikke øges uden ekstra energi. Når du hævder en stigning i planetens temperatur, bryder du den første lov af termodynamik. Seriously, I´d love to hear you elaborate on how 2) above violates the 1st law of thermodynamics in your imagination. Please try to do a more thorough job than just repeating the words fed to you by your cute little "storyboard"-roleplaying site. Do you honestly believe that improved retention of energy by an object violates some of the laws in physics? And if so, how did you seriously come up with this? Again, out of sheer curiosity, I do love exploring the tangled paths the human mind follows sometimes. Ukorrekt. Du kan ikke tilføje energi ved at reducere tab. Christoffer Bugge Harder skrev: Seriously, I´d love to hear you elaborate on how 2) above violates the 1st law of thermodynamics in your imagination. Du lyver. Du er ikke interesseret i at lære. Hvorfor har du endnu ikke lært den første lov om termodynamik? Du ville ikke stille dette spørgsmål, hvis du havde lært det. Temperaturen kan ikke øges uden ekstra energi. Hvis du hævder, at temperaturen er steget, hævder du, at der er ekstra energi. Hvis det eneste der har ændret sig er, at der er mere CO2, hævder du, at CO2 skaber ekstra energi. Christoffer Bugge Harder skrev: Do you honestly believe that improved retention of energy by an object violates some of the laws in physics? Jeg ved meget godt, at reduceret stråling og øget temperatur er en overtrædelse af Stefan-Boltzmann. The wanting keyword in your sentence is "to the system". Again, there is no new energy "created" to the system of sun, space and earth. With a constant solar output of 342 W/m2, the Earth receives the same amount of energy with and without a greenhouse effect - there is no extra energy "created", nor does there need to be. The difference with a greenhouse effect is simply that a fraction of the energy generated by an insolation of 342 W/m2 - again, for the hard of understanding, that same amount of energy - is retained in the Earth part of the Sun/space/Earth system instead of getting lost to space. This is no more in violation of the 1st law than somebody putting on a jacket and thus retaining more of the same amount of external energy supplied close to his body rather than losing it to the surrounding airspace. No. For the umpteenth time, more CO2 does not "create" any energy, it radiates part of the outgoing radiation back to Earth instead of it getting lost to space. No new energy is created in the system, the energy which ultimately originates from the sun is merely redistributed between two net recipients (Earth and space). And no, also for the umpteenth time, this does not mean that the radiation leaving the Earth system is decreased - it merely means that the point where there is balance between in- and outgoing radiation is elevated further up into the heights. At equilibrium, there is 240 W/m2 coming in, and 240 W/m2 leaving in any case. The only place where new energy is supposedly "created" is inside your own head. Christoffer Bugge Harder skrev: The wanting keyword in your sentence is "to the system". Again, there is no new energy "created" to the system of sun, space and earth. With a constant solar output of 342 W/m2, the Earth receives the same amount of energy with and without a greenhouse effect - there is no extra energy "created", nor does there need to be. Dette er, hvad videnskabelig analfabetisme ligner. Energi skal bestemt skabes for temperaturen at stige over ligevægtstemperaturen. Gennemgå den første lov om termodynamik. Christoffer Bugge Harder skrev:The difference with a greenhouse effect is simply that a fraction of the energy generated by an insolation of 342 W/m2 - again, for the hard of understanding, that same amount of energy - is retained in the Earth part of the Sun/space/Earth system instead of getting lost to space. Du skrev mange ord her. Du skulle kun have skrevet "det reducerer en smule jordens udstråling." Christoffer Bugge Harder skrev: For the umpteenth time, more CO2 does not "create" any energy, it radiates part of the outgoing radiation back to Earth instead of it getting lost to space. For den milliontid, hvis du hævder at Jordens temperatur stiger, hævder du, at der skabes energi. Jeg er ligeglad med hvor mange gange du benægter dette. Du undgår ikke at krænke fysik simpelthen ved at insistere på, at du ikke har krænket fysikken. Endnu en gang: Hvis du hævder at Jordens temperatur stiger, hævder du, at der er ekstra energi. IBDaMann skrev:This is what scientific illiteracy looks like. Energy must certainly be created for the temperature to rise above the equilibrium temperature. Review the first law on thermodynamics. The First Law of Thermodynamics states that heat is a form of energy, and thermodynamic processes are therefore subject to the principle of conservation of energy. This means that heat energy cannot be created or destroyed. It can, however, be transferred from one location to another and converted to and from other forms of energy. It sure seems like you have not read the first law yourself. That fits with you not being able to actually use the Stefan-Boltzmann-law either, despite going on and on about it. The reason is, of course, that all you do is regurgitate some sentences you have been fed on the "storyboard" tinfoil hat page. You wrote many words her. All you should have written was "it reduces Earth´s outgoing radiation slightly." My answer is in short: You violate Stefan-Boltzmann. I could have put it simpler indeed: it does not reduce the Earth´s radiation, it merely moves the point of radiative balance between in- and outgoing radiation higher up in the atmosphere. And once again, could you perhaps try doing a little math to show that you have any clue as to what the SB-equation is actually about? For the umpteenth time, more CO2 does not "create" any energy, it radiates part of the outgoing radiation back to Earth instead of it getting lost to space. IBDaMann skrev:Once again: If you claim that the Earth's temperature is rising, you claim that extra energy has been created. "Creation" of new energy violates the First law, so no. But again per the First law, extra energy from the sun has indeed been transferred from one location to another (from the sun through space to the earth) and converted from one form of energy to another (from electromagnetic energy (radiation) to thermal energy). If the greenhouse effect increases, this simply means that relatively more of the constant energy supplied by the sun to the system is added to the Earth and its atmosphere rather than to space. Energy is transferred and redistributed, not created. Again, read a text book - the only violations occur inside your own head. And of course, being yet another poor monolingual venturing far outside his comfort zone aided only by Google Translate does not exactly help you either. [quote]The First Law of Thermodynamics states that heat is a form of energy, and thermodynamic processes are therefore subject to the principle of conservation of energy. This means that heat energy cannot be created or destroyed. Ordet "varme" anvendes ikke i fysikken. Ja, ordet "varme" bruges nogle gange til at forklare begreber til mennesker. "Kold" er ikke brugt fysik. "Wet" bruges ikke. Ordbogen er ikke en fysik lærebog. Du misforstod det, jeg skrev. Du skal faktisk lære den første lov af termodynamik. Du forstår ikke konceptet. Du er ikke klar over, når du overtræder det. Det var korrekt at sige, at du ikke har til hensigt at lære noget. I stedet for at lære, vil du insistere på at din fejl er korrekt ..
Ordet "varme" anvendes ikke i fysikken. Über die von der molekularkinetischen Theorie der Wärme geforderte Bewegung von in ruhenden Flüssigkeiten suspendierten Teilchen. While I did, of course, realise that you were too stupid to understand simple German, I did think you would be capable of google translating the word "Wärme" (heat, "varme" in Danish). But apparently, I was wrong. Anyway, that is your problem, not mine. Du misforstod det, jeg skrev. Du skal faktisk lære den første lov af termodynamik. Du forstår ikke konceptet. At the very least, please don´t blame me for you being yet another monolingual idiot making ridiculous google translate-mistakes when writing in a language you have no clue about. Unless you think that the Earth is now at its equilibrium temperature of 255K (in which case you would not be sitting here with your tinfoil hat in your basement collecting your welfare and writing on a computer), temperature of Earth has been above its equilibrium for pretty much its entire existence. And look up any definition of the first law stating how energy cannot be created in the very first sentence - every single time. And now, once and for all: Just as when Earth is heated by enhanced solar irradiance, heating by an enhanced greenhouse effect requires transfer of energy which ultimately originates from the sun, not "creation" of energy (which does not exist). If you think otherwise, you are wrong. And no, I don´t intend on "learning" from you, as this would spell an end to any hope of doing actual scientific research on this planet. If you are honestly too dumb to grasp this, then I think you need to just accept that you need to go home and focus on spending your time on something where you can make a better use of your life and skills. How about finishing high school, getting a day job, and finding a girlfriend and some friends? Du forventer, at jeg lærer dig den videnskab, du burde have lært, da du var barn. Selvfølgelig bruger folk "varme" for at forklare begreber ... til børn og andre, der ikke har lært de rigtige tekniske ord. Jeg har ofte sagt, at "varme" er et naturligt sprogord som "våd", "trist", "kold", "regn" og andre. Du insisterer på, at der er en videnskabsmodel for "varme". Vis mig modellen. Jeg vil ikke spilde mere tid, før jeg ser denne fysikmodel af "varme". In the Global Warming theology, "heat" means whatever it needs to mean at any given moment. The term is employed by Global Warming believers to shift semantic goalposts as necessary. It's meaning can shift fluidly between "temperature," "increase in temperature," "thermal energy," "flow of thermal energy," "convection," "absorption of electromagnetic radiation," "energy," "conduction," "infrared," "plasma," "work," "power," "radioactivity," "electrical energy" and others as convenient. Det er skrevet på engelsk. Jeg formoder, at du er for dum for at finde ud af, hvordan det beskriver dig. Vis mig modellen. Lad os tale fysik. Og lad os løfte diskussionen ovenfor, hvad dine børn lærer dig. So let me get this straight: When Einstein used the word "Wärme" (heat) in his seminal 1905 paper which he wrote to the editor and fellow Nobel Laureate Max Planck for publication in "Annalen der Physik" (the then leading scientific journal in the world), then he was merely trying to "explain concepts for children and others unfamiliar with the correct scientific terminology"? I realise that you are merely a troll in need of attention, but I am still amused by the levels of disconnect to reality people who have read one holy book and nothing else are capable of involuntarily displaying. 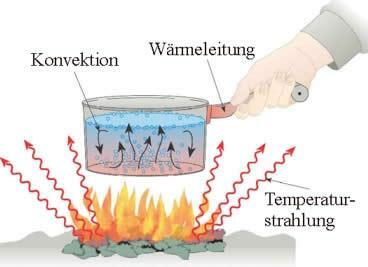 Your "storyboard" manual writes some jaw-droppingly ignorant rubbish about "heat", and you just lap it up rather than actually consult one simple physics textbook. Had you done that, the book would have informed you that heat has a very specific meaning: transfer of energy (not matter or thermodynamic work) between two thermodynamic systems. It can be through conduction (between bodies in contact), radiation between distant bodies, Ohmian heating through an electric current, or some mechanical work. The sun and the greenhouse effect heats the Earth through radiation, and the Earth loses energy again also primarily through radiation and through adiabatic transfer of work by expanding air (convection). FYI, "work" in physics also has a very precise and specific meaning, besides also being an everyday term for something you ought to go out and try someday. Just like the word "nut" in biology is a very precise definition of one type of fruit, even if it can also have a broader meaning in colloquial English when referring to certain types of bloggers. The world is indeed fascinating, isn´t it? So let me get this straight: When Einstein used the word "Wärme" (heat) in his seminal 1905 paper which he wrote to the editor and fellow Nobel Laureate Max Planck for publication in "Annalen der Physik"
Jeg vidste, at du ville gøre det her. Du er absolut forudsigelig. Hvilken del af "udgivelse" forstår du ikke? Hele verden var publikum for det pågældende papir. Yeah, sure, as we all know, the entire world, and particularly children and uninformed laymen, is the intended audience for technical papers on molecular kinetics, quantum mechanics and DNA sequencing technology. This must be the reason why scientific journals always admonish us scientists on page one in their instructions about how we should never use technical terminology, equations or large numbers when reporting our results. Or something. And of course, it goes without saying that just because you are yet another monolingual English-speaker who could not possibly pass a middle school physics test, it would be unwise to think that this should preclude you from being included in the intended audience of a German-language scientific paper on advanced physics. OK. Here is a model of heat transfer that I think might be for you. Let me know if you have any trouble. "Strahlung" is radiation, "Leitung" is conduction, and "Konvektion" I will let you try through google translate. Ja. Jeg læste dem, da jeg var teenager. Disse papirer er skrevet til offentligheden. Tak for at bekræfte, at du ikke læste dem. Du har stadig ikke givet en "varme" fysik model. (1762) Just a tip, before the administrator kicks you out of klimadebat.dk for trolling in a language you don´t understand and disrupting meaningful discussions: For the next blog you choose as subject for your trolling, you will want to come up with a more convincing story than how a poor monolingual English-speaker struggling with understanding the basics of heat transfer, heat capacity and the first law of thermodynamics read through Einstein´s German-language science papers, let alone understood them. Radiation that hits an object is turned into heat energy - or thermal energy, if you prefer this word. "Thermal energy" is not a shred more precise or scientific a term than "heat energy", and judged by the physicists but since its etymology is Greek, I guess is does sound more "sciencyish" to the average imposteur who wishes to appear knowledgeable. Actually, more than 1000 scientific papers have been published in the last 4 years featuring "heat energy" prominently in the title. So, apparently a whole lot of physicists have failed to learn the "correct technical terms". Maybe you could offer a scientific course? Just let me know your real name and academic affiliation. Oh yes, and where and when did you get your PhD? Just let me know your real name and academic affiliation. Oh yes, and where and when did you get your PhD? Dette er roden til dit problem. Du har aldrig lært videnskab. I stedet stolede du på nogle religiøse fanatikere, der løj til dig. Du tror, ​​at videnskaben ikke er nødvendig for at diskutere videnskaben. Du tror, ​​at videnskaben er andres mening. Når jeg beder dig om videnskab, henviser du altid til andres meninger. Du giver ikke videnskab. Jeg venter stadig på videnskaben om "varme". Nu, i stedet for at give videnskab, spørger du mig om legitimationsoplysninger. Du mener at legitimationsoplysninger omdanner meninger til videnskab. Ingen meninger er videnskab. Einsteins yndlingsfarve er ikke videnskab. Du siger "varme" er videnskab. Nu er det tid til at give videnskaben om "varme". Giv mig modellen. Jeg vil ikke have nogen meninger. Jeg vil ikke vide, hvor mange papirer der er skrevet. Du behøver ikke mine legitimationsoplysninger. Bare skriv videnskaben her.